The Balkan Olympiad in Informatics 2018 (BOI 2018) takes place between the 7th and 13th of July 2018, in Timisoara, Romania. The official site of the competition can be found here. Let's discuss the tasks after each contest day. Can you provide tasks from 7th july ? Tomorrow is the first day of competitions, both for junior and senior teams. Will there be live standings at least? Competition must have started, does anybody have a clue if there will be a livescore? Can't find any on the website. There is no public livescore. Takes last submission, not best — at least that's what I got told. It doesn't take the best submission, it takes the last one, so the standings aren't always the best ones. I'll try to update them every 30 minutes. And for the rankings, the committee's 'excuse' for that is that something is going to crash if they make it public. I can publish the tasks if you want. Can you publish the tasks, please? I don't have English version of printed tasks, but I can write a brief description of tasks. minmaxtree : We are given a tree of size N (N <= 10^5 or so), and we should reconstruct the tree (weights of every edge) in order to fulfill M (M <= 10^5 or so) constraints of type MAX u v x, meaning that the maximum of all the edge weights on simple path from node u and node v is equal to x, and MIN u v x, meaning the same thing but for the minimum. It's guaranteed that the answer will always exist. elections Given a string of 'C' and 'T's (of length <= 10^5) , we should answer Q (Q <= 10^5) queries of type L R. Answer to the query is the minimum number of removals to make interval [L, R] good. A good interval is defined as an interval in which there is no prefix or suffix containing strictly more 'T's than 'C's. homecoming We are given a circular list of N (N <= 10^5) books, each having cost A_i. Also, for every consecutive interval of size K (exactly N of them), we are given a prize we get if we buy them all. We are asked what is the highest amount of money we can get. This is just a brief overview, I may have made some mistakes and if I have, sorry for that. Also, the constraints aren't exact, but they are between 1e5 and 1e6 for every task so it doesn't matter much. I'd like to hear your solutions. 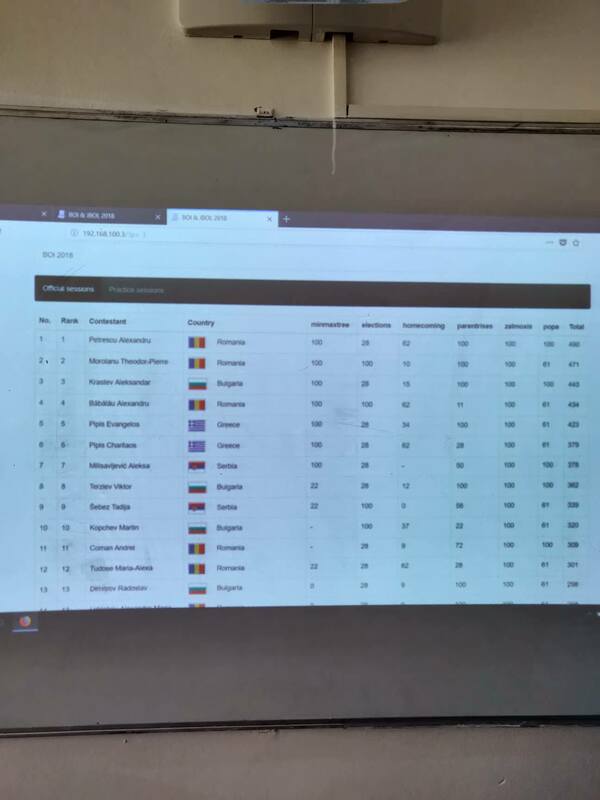 Upd: First two Romanians scored 200, milisav scored 100 on first problem, nothing apart from that in top 10 has changed. Upd: TadijaSebez solves elections and claims the third place! Can you give one last update before the end? Final BOI results, photo by perchema. GG, petrescu. What about JBOI results, can somebody post those? You can also see the standings in the link i provided above. Can you also provide a screenshot for the JBOI? Can you share JBOI tasks, please? Given N, find sum as an irreducible fraction . Output P and Q. Given a set of N <= 10^5 non-intersecting (and non-overlapping) rectangles with sides parallel to coordinate axes, and having coordinates between 1 and 10^6, answer Q <= 10^5 queries of kind: Find the sum of the lengths of intersections of a ray with every rectangle in the set, where every ray is starting from some point at x-axis and forming an angle of 45 degrees, 90 degrees, or 135 degrees with x-axis. Can you also add the JBOI ranking? I don't have access to it. I'll ask the JBOI committee later. 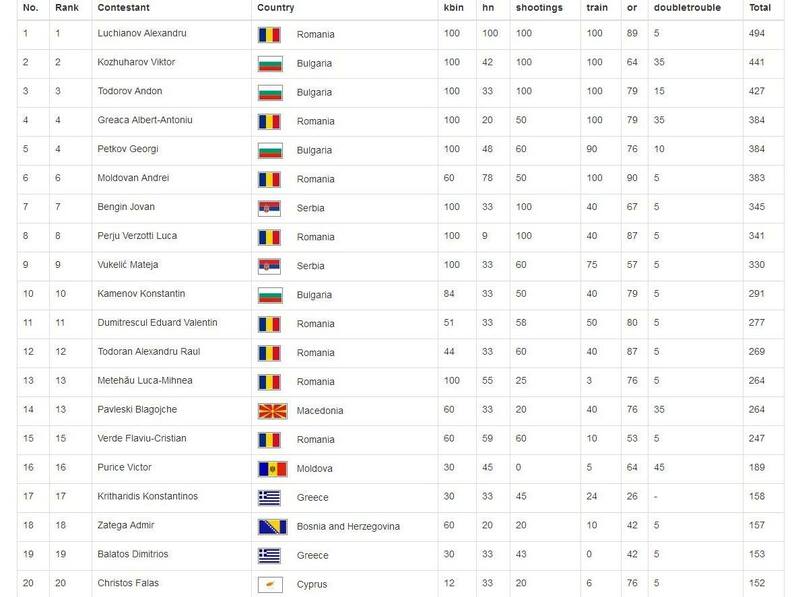 There are people from Turkmenistan in the results table. But Turlmenistan isn't a Balkan Region country. 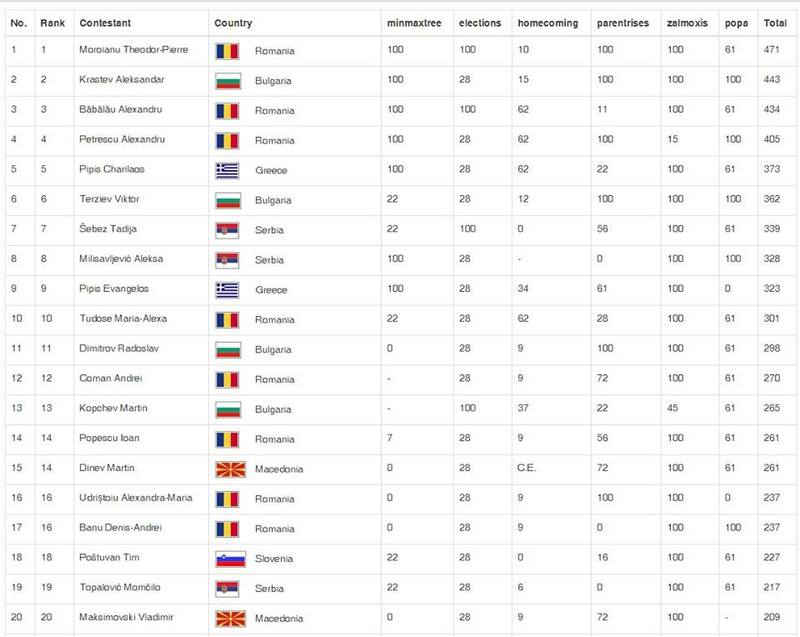 How other countries (not from Balkan region can participate in this contest)? Look at the rules, they can be invited but they aren't official participants IIRC. What happened to Turkish team? They're in the participant list but none of them in standings. Our team's leaders' passport issuances were delayed due to bureaucratic reasons. So sadly we couldn't attend this year's Balkan Olympiad. Does anyone know of a judge where you can submit the problems which have a special checker (minmax tree for example)? And have the official checkers been published? They haven't been posted on the official website, but we don't mind sharing them with anybody who wants to add them to an online judge. I have a question: the tests for the task popa seems obfuscated. Can you provide testcases in a normal format or tell us how we can extract them ourselves? The input is as Andrei1998 said. It is not necessarly to think it as gcd. There could be lcm or other such operation as well. This is the only thing the grader is based on. I will upload the grader to the BOI official website shortly. How many contestants won a medal? The only information I have at the moment is that at least 22 participants (including the unofficial participants) won a medal in the JBOI. The ceremony was held, yet there are no final standings with medals on the site. Auto comment: topic has been updated by Andrei1998 (previous revision, new revision, compare). Server time: Apr/25/2019 23:59:08 (e1).